The performance I saw of Marceau took place in the John F. Kennedy Center for Performing Arts, Washington, D.C. in 1980. Anyone who knows me well recognizes that I am not greatly sympathetic with the art of mime, particularly with the street-based mimicry that one witnesses in large cities throughout the world. 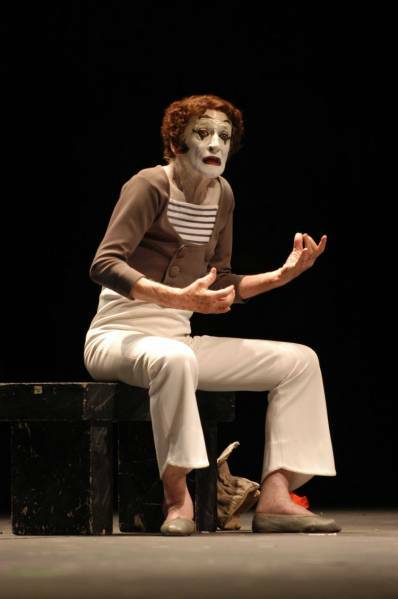 As I wrote this year in my essay on Michelangelo Antonioni’s Blow-up, “I once quipped that all mimes should be shot at birth.” But when it comes to the art of Marcel Marceau, who died on September 22, 2007, I make an important exception. Marceau spent most of his long life in theater as a white-face, soft-shoed personage with his head covered with well-worn hat topped by a red flower, a persona he called Bip, a reference to the Charles Dickens character of Great Expectations, Pip. Bip’s antics were closer to Harlequin than to those of a circus clown (although the great Ringling Brothers, Barnum and Bailey sad-faced clown, Emmett Kelly—who I saw as a child in one of their last tent performances—might be said to have been influenced by Marceau), his movements more similar to those of dance (it is no accident that Michael Jackson based his “Moonwalk” steps on Marceau’s “Walking Against the Wind”) than to the wooden and mechanical gestures of street mimes. Indeed, Marceau himself disparaged most of his imitators. For Marceau’s movements owed less to vaudeville than to the nearly flawless movements of the great silent film comedians Charlie Chaplin, Buster Keaton, and the Marx Brothers. One need only revisit the little tramp’s now notorious waddle through town and country, his choreographic struggles with machinery in Modern Times, and his pas de deaux with a globe in The Great Dictator, observe Keaton’s daring leaps across train cars in The General or his fruitless yet miraculously successful struggles against the cyclone of Steamboat Bill, Jr., and recall Groucho’s perfectly executed leaps, slides, and daffy spins of his dance in Animal Crackers, or any of Harpo’s sleights of hand—all of them admittedly influences upon his art—to recognize their importance in Marceau’s artistry of moving his body through space. By that statement, I don’t think he was simply speaking of the Mozart music which accompanied the piece, but was referring to the many sounds silence entices into its seeming emptiness. In Marceau’s silent dances of “Youth, Maturity, Old Age, and Death”—the title of one of Bip’s sketches—all the tumult and clamor of those various states of life echo through the audience, reflected in the gestures of the face, hands, chest, hips, legs, and feet of the performer. The symphony of our own settlement, the coughs, creaks, giggles, whisperings, and taps of the audience are part of any performance, but in this great mime’s art, seem subtly incorporated in movement itself. Off stage, Marceau was an inveterate talker. He once admitted to an interviewer: “Never get a mime talking. He won’t stop.” It was his involvement with his audience that so separated Marceau from other mimes, whose machine-like performances often seem dissociated from the every day, representing extraordinary exaggera-tions of daily activities. Born Jewish in the French-German-speaking Strasbourg, Marceau was the son of a baritone-singing butcher who was later imprisoned in Auschwitz, where he died. Escaping to the Southwest of France, the son changed his name from Mangel to Marceau and, with his brother Alain, became active in the French Resistance, altering children’s identity cards to save them from Vichy-German deportation. Through his ability to speak English, Marceau became a liaison officer to General Patton. 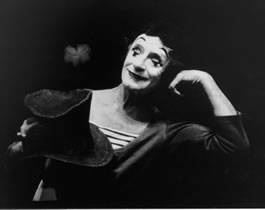 Enrolling after the war in the Charles Dullin School of Dramatic Art, Marceau studied with the mime Etienne Decroux. So was Bip born. Accordingly, one might say that his persona was born out of Marceau’s political activities, which explains, in part, what helped to make his performances so human, what helped to bridge a connection between him and his audiences.